L. Gordon White was born in Fluvanna County, VA, on 23 July 1882. He was the son of William C. White, a former Virginia State Senator, and Eugenia Harris White. Gordon spent his boyhood on the White family farm at Hardware on the James and was educated at Seven Islands Academy in Buckingham, VA. In 1906, Gordon married Miss Caroline Rawlings of Battleboro, N.C, and in 1907 came to Scottsville where he made his home during his lifetime. For fifteen years, he served as a telegrapher and station operator for the Chesapeake and Ohio Railway -- one year at Warren and the remaining fourteen years at Scottsville. In 1914, he resigned from his railroad position and organized with T.E. 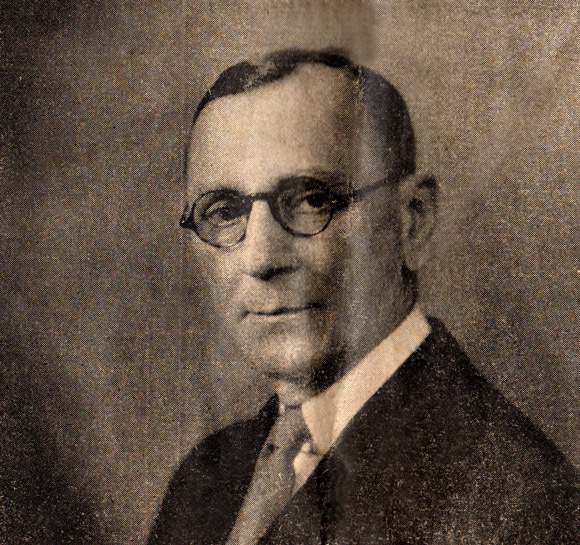 Bruce, then the Mayor of Scottsville, the firm known as The White-Bruce Motor Company. 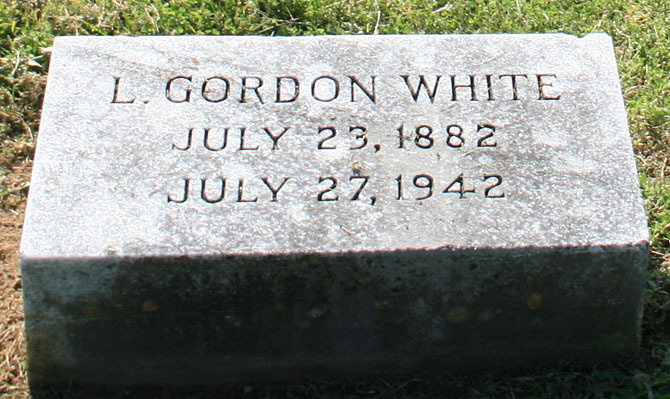 Gordon was serving in his fifth term as the member of the Virginia assembly when he passed away on 27 July 1942 and is buried at Scottsville Cemetery, Scottsville, VA.
L. Gordon White, one of Scottsville's most prominent and highly esteemed residents and a member of the House of Delegates from the counties of Albemarle and Greene and the City of Charlottesville, died Monday night at his residence on the outskirts of town. He had been in failing health for the past year and during recent months had been treated at the University of Virginia Hospital in Charlottesville. Mr. White, who was sixty years of age at the time of his death, was serving in his fifth term as a Member of the Virginia Assembly. During his long and successful career in the State Legislature, he represented his constituents with unswerving loyalty and diligence and took a leading part in the enactment of many important bills, among them Virginia's old age assistance law and bills for the improvement of education and elimination of tax inequalities. He was especially interested in securing appropriations for the University of Virginia, Blue Ridge Sanatorium, and the Virginia Workshop for the Blind, all located in Charlottesville. He was appointed as a member of several special committees including the powerful House Committee on Appropriations, Committees on Roads, Enrolled Bills, and Immigration and the State Budget Commission. Funeral services were held Wednesday afternoon at 4 o'clock from the residence with the Rev. E.B. Meredith, rector of St. John's Episcopal Church, officiating, assisted by the Rev. Oscar E. Northern, pastor of the local Baptist Church and the Rev. Mack Thomasson, pastor of the Methodist Church. Internment followed in the Scottsville Presbyterian Cemetery with special Masonic rites held at the grave. Active pallbearers were Mayor T. E. Bruce, Reeve Nicholas, C.R. Dorrier, Dr. L.R.. Stinson, Judge L.R. Smith of Charlottesville, E. L. Bradley, and Thomas Goodman. Honorary pallbearers included Governor Darden, former Governor James H. Price, Lieutenant Governor W. M. Tuck, Aaron Seay, George Seay, Judge Archie D. Dabney, Thomas B. Stanley, E. Griffith Dodson, Jay Winston Johns, Randolph H. Perry, W. Towles Dettor, George T. Omohundro, Sr., James F. Dorrier, E.V. Walker, Henry Haden, Jessie Wilson, Samuel Jessup, W. S. Dorrier, Charles T. O'Neill, Colonel E. J. Perkins, George E. Bowles, W. D. Smith, Dr. Percy Harris, Raymond Jackson, and Verbon E. Kemp. Speaker Thomas B. Stanley, of Martinsville, named Delegates Edward O. McCue, Jr., of Charlottesville; Robert Whitehead, of Nelson; C.G. Quesenberry, of Augusta; Harrison Spotswood, of Orange; Henry Johnson, of Goochland and Fluvanna, as a committee of House members to attend the funeral. 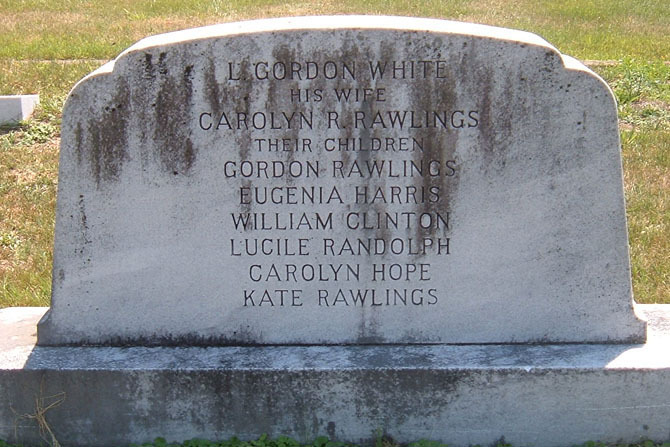 Besides his wife, Caroline, he is survived by the following six children: Lieutenant G. R. White, U.S. Army, now stationed in Chicago; Major W. C. White, U.S. Army, at present assigned to the Surgeon-General Office in Washington; Mrs. Eugenia Byrd, of Ossipee, NC; Mrs. Lucile White Aylor, of Culpeper; Mrs. Hope Slate, of Emporia, and Miss Kate Rawlings White, of Scottsville. He also leaves two brothers, E.O. White, of Scottsville, and E.R. White, of Springfield, Fairfax County. The photo of L. Gordon White (1942) accompanied his obituary in the The Scottsville News and Albemarle Courier, dated July 31, 1942.